Philippe Coutinho is to realise his dream of moving to Barcelona despite Liverpool's "great reluctance" to let the Brazilian playmaker leave Anfield for a British record fee worth up to £142million. The 25-year-old was the subject of a £118million bid from the Catalan club in August, an approach Liverpool rejected, but he is now heading to the Nou Camp after a deal was agreed on Saturday. A statement read: "Liverpool can confirm Philippe Coutinho will be leaving the club after a transfer agreement was reached with Barcelona, subject to medical and agreement of personal terms. Barcelona made Coutinho their number-one target after his countryman Neymar made a world-record £200.6million move to Paris St Germain in August and he will sign a five-and-a-half-year contract. "I can tell the Liverpool supporters that we, as a club, have done everything within our means to convince Philippe that remaining part of Liverpool was as attractive as moving to Spain, but he is 100 per cent certain his future - and that of his family - belongs at Barcelona. After being rebuffed by Liverpool when making three bids for Coutinho in the summer, Barcelona instead bought French forward Ousmane Dembele from Borussia Dortmund for £93million. That initially reassured Liverpool fans that Coutinho would not be pursued again, but Dembele has missed the last four months of action through injury and speculation about a renewed Catalonian bid for the Anfield favourite grew ever louder heading into the new year. The saga took an unexpected turn when Nike reportedly advertised a Barcelona shirt for sale with the Brazilian's name on it in late December. The page is no longer on the website. 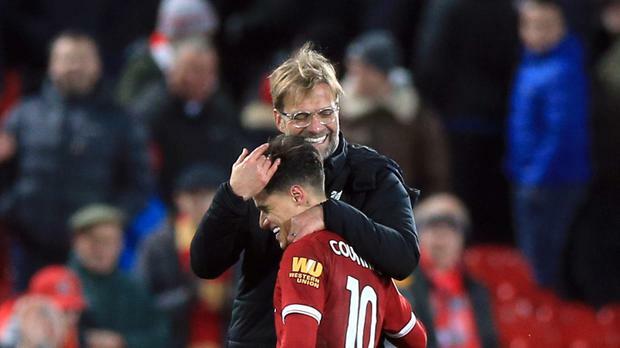 Press Association Sport understands the fee for Coutinho consists of an initial 120 million euros (£106.5million), with a further 40 million euros (£35.5million) hinging on add-ons involved in the signing. Barcelona said the buy-out fee in his new contract will be 400 million euros (£354.5million). He had not played for Liverpool since the January transfer window opened because of a thigh problem and did not travel with the squad for their warm-weather training camp in Dubai. Coutinho instead headed to Spain to formalise his transfer on Saturday night and it is expected he will be presented by LaLiga leaders Barcelona on Sunday or Monday. The Rio-born player arrived at Anfield from Inter Milan for £8.5million in January 2013 and scored 54 goals for the Reds across his appearances in all competitions, although he won no silverware during his five-year stay.